Home 2016 February 12 Power Cli, PowerShell, Uncategorized, Vmware, vRealize Orchestrator Invoke PowerShell Scripts using vRO 7.0 with a vRA 7.0 Self Service Portal Part-1. 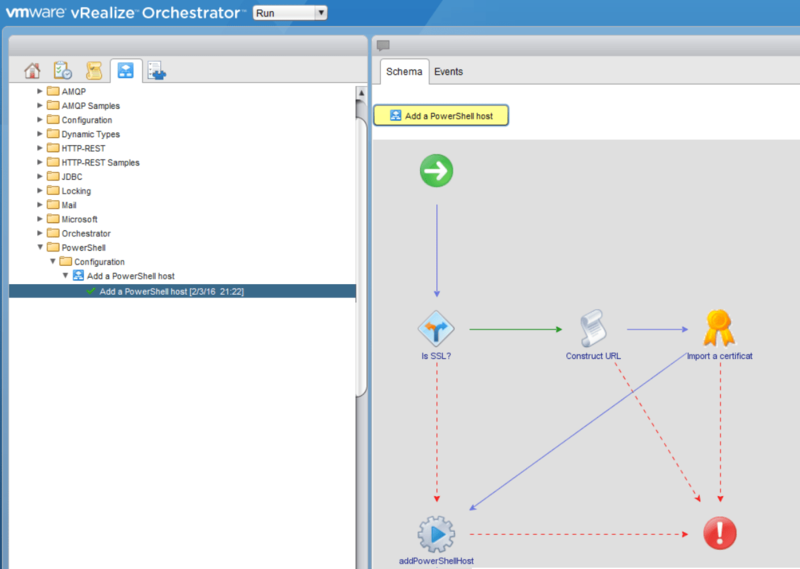 In this blogpost i would like to share my experience of integrating vRealize Automation with vRealize Orchestrator and how seamless it is to create a custom workflow which can invoke powershell script from vRO powershell host. As we all know PowerShell is one of the most admin friendly and integrates with almost every product we have in market now. With this integration we can create a custom self service portal using vRA and provide multitudes of service offerings which use powershell script’s and vRO powershell host in the background to perform an activity. So lets get started with the details on the solution, Invoke PowerShell Scripts from VRO . Prerequisites involve, a powershell host added to the vRO appliance, you should be able to see a green check-mark once the workflow successfully completes its execution. You can follow these excellent blog posts on how to add a powershell host if you have not done it yet. Also if you are using an external orchestra-tor server make sure that you have configured it to be used with v Realize Automation. Once all the pre-requisites are met, lets start with the integration script and workflows. 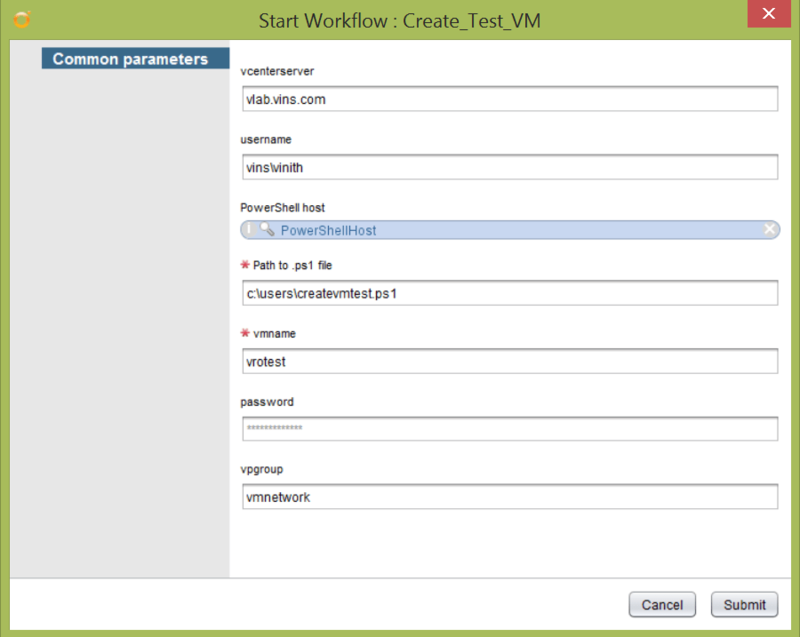 For my testing purpose i would be illustrating the integration by creating a workflow which invokes a powershell script which would basically uses the PowerCLI cmdlets to create a test VM based on the form input provided either through vra or vro. Log into the vRO console, and change the view to design mode. 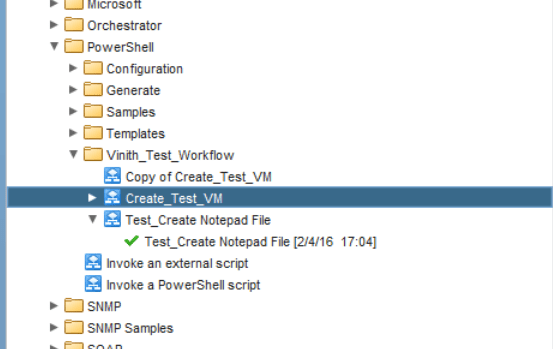 and create a new workflow called as “Create_Test_VM”. Next Click on the edit (pencil icon) workflow button present on the top end of the screen to edit the workflow. Drag and drop the scrip-table task and Invoke an External script schema integration components into the design whiteboard in schema view. Next lets start configuring each of these elements. Click on the “Inputs” tab and define the parameters which would be fed into the powershell script. Note that the password to connect to the vcenter can be declared a “Secure String” type which allows you to mask out the password with “******” in the input form :), now that’s really cool without the use of any custom programming. Once we define the input parameters, head over to the output tab, and create a new parameter called as “scriptarg” and move it as an attribute, this attribute will contain the format of how we pass the parameters to the powershell script. 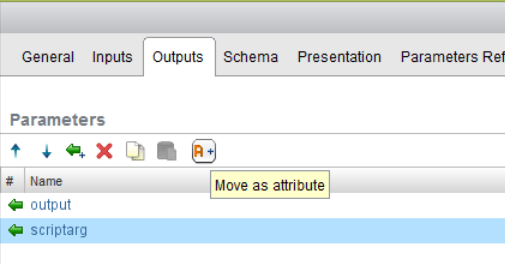 Next move to the schema view and edit the properties of the “Scriptable Task” schema object. 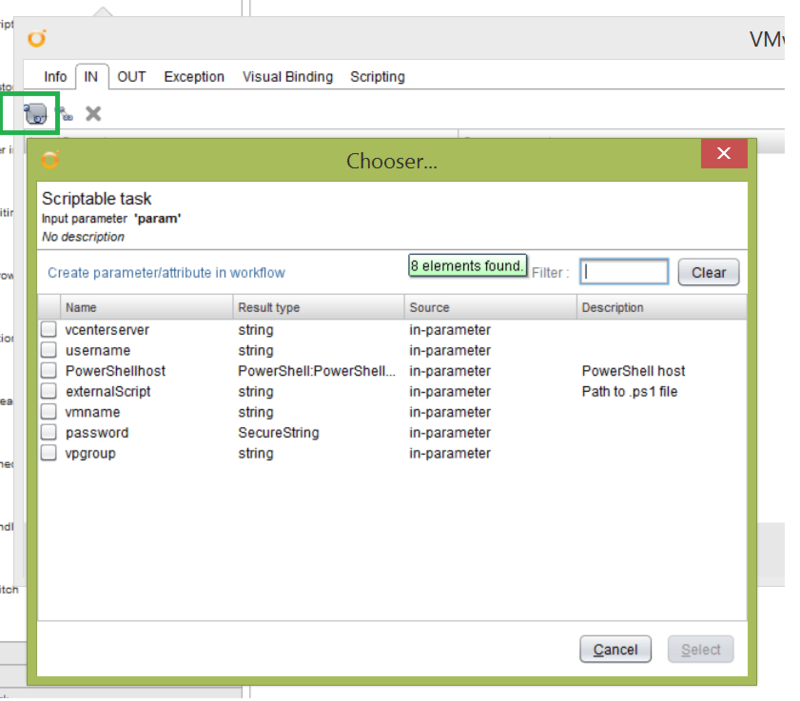 Click on the “Bind to workflow parameter button” and select the input parameters we defined in the previous step. Next click on the visual binding tab and make sure that you see a similar binding structure as depicted below. Next move on to the scripting tab and define the exact arguments which would be passed on to the powershell script. Note that you would need to take care of spaces between the parameters or else the powershell script would not be able to understand the parameter format. Next edit the properties of the “Invoke an external script” schema object and select “scriptarg” as the argument to the powershell script. Click on save and close the workflow. Woaahh!, now that was a huge set of steps, but i hope that my screen-capture based step by step procedure helped you out a lot. Next lets test the workflow , click on run, and feed in the required parameters and click on submit to Invoke PowerShell Scripts using VRO . Here’s the VM Cloning script which gets called. Waits customization process for list virtual machines to completes. The script returns if customization process ends for all virtual machines or if the specified timeout elapses. 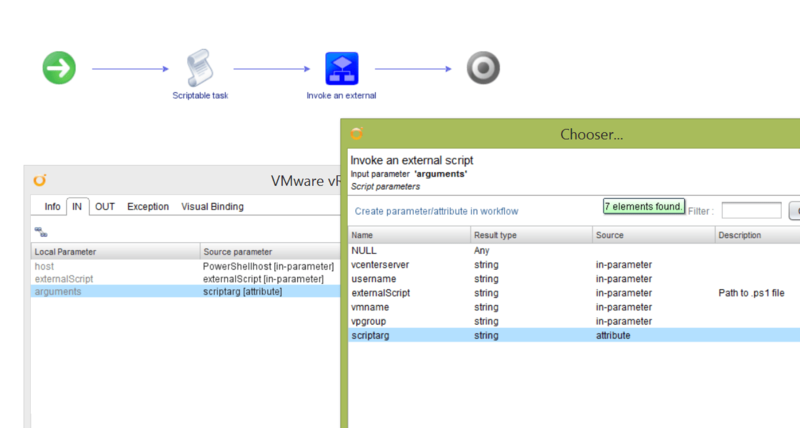 The script returns PSObject for each specified VM. The output object has VM and CustomizationStatus properties. The script is based on sveral vCenter events. * "VmNotStarted" - if it was not found VmStarting event for specific VM. * "CustomizationNotStarted" - if it was not found CustomizationStarterdEvent for specific VM. Write-Host "Start monitoring customization process for vm '$vm'"
Write-Host "Customization for VM '$vmName' has failed"
I hope you enjoyed this blogpost on “Invoke PowerShell Scripts using VRO” and found the information useful, there is no limit to the endless possibilities we can attain with powershell an powercli in hand !! Stay tuned for my next post where i would show how easy it is to integrate this solution with vRealize automation and offer this service to end users via a self service portal. thanks, great post, got it all set up! The only thing that’s off is that password isn’t passed to the script. Any idea why this is failing? Oops was related to my password, which started with @. It’s working now! Thank you for posting this! Great Job. I have a quick question , do we need to enable credSSP on powershell host for delegating AD permissions.